Welcome to the first episode of Animal Cafe! This week I spoke to Marjie Alonso, the President and Executive Director of the International Association of Animal Behavior Consultants (IAABC). We spoke about the IAABC, of which I am both a member and a Board member, and about our upcoming conference, which has a fantastic line up of speakers. Marjie is a professional dog trainer and behavior consultant living in Somerville, MA., with her two dogs, two sons and very understanding mate. Marjie first started dog training in the late 1970s, eventually starting her own full time training and behavior consulting business, City Dog Training, LLC. 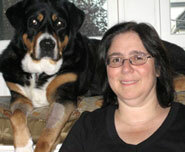 Marjie serves as behavioral consultant for the New England Dog Training Club, the oldest AKC club in the US, and for several dog rescue groups and shelters, providing evaluations, rescue dog acclimation programs, one-on-one training sessions, training plans and behavior modification programs. Marjie is a member of the America Humane Association’s Advisory Board for Companion Animal Behavior and Training. Marjie is also a contributing expert trainer for Dogtime.com and the Australian site DogTraining.net. Marjie takes her continuing education quite seriously, and attends many seminars, workshops and advanced internships each year in the field of dog behavior, behavior modification techniques, training and temperament evaluation and assessment. Recent seminars include those by Sue Sternberg, Suzanne Clothier, Patricia McConnell, John Rogerson, Clicker Expo, APDT Annual Conference, Kathy Sdao, Pia Silvani, Jean Donaldson and many more. Marjie is a Certified Dog Behavior Consultant (CDBC) with the International Association of Animal Behavior Consultants, a Certified Professional Dog Trainer (CPDT-KA), an AKC Canine Good Citizen evaluator, and a Professional Member of the Association of Pet Dog Trainers (APDT). This entry was posted in Eric Goebelbecker, Training and Behavior on March 6, 2011 by Eric Goebelbecker. Nice interview, Eric. I love IAABC, and was glad to hear Marjie clarify what the organization is about. I kinda liked the dog barking in the background, too! Happy Grand Opening, Animal Cafe! I enjoyed your first podcast and hope to return for the chat. Great first podcast. I didn't know anything about the IAABC.